In his Latin America tour U.S. Vice President Mike Pence is securing more support against Venezuela’s recently re-elected President Nicolas Maduro. June 27 (teleSUR) As United States Vice President Mike Pence continues his visit in Brazil, where he called for more “pressure” against Venezuela, Venezuela’s Foreign Minister Jorge Arreaza highlighted the “irony” of an anti-Latino-immigrant government interfering in Latin American affairs. “What an irony and hypocrisy that @VP Pence, whose racist government separates families and cages innocent children, intends to interfere in the affairs of our region. Venezuela and Brazil reject the presence of such violator of Latin American immigrants’ human rights,” Arreaza said via Twitter Tuesday. The Venezuelan comments came in response to Pence’s earlier comments against the Venezuelan government of Nicolas Maduro. “The U.S. asks Brazil to adopt firm attitudes towards Nicolas Maduro’s regime, which destroyed democracy and has built a brutal dictatorship that has made Venezuela a poor country,” Pence, who is touring Latin America, said in a press conference accompanied by Brazil’s Senate-imposed President Michel Temer. Brazil, a member of the so-called Lima Group, is an important U.S. ally in the region. “Brazil has led efforts to expel Venezuela from Mercosur, joined the U.S. to suspend Venezuela from the Organization of American States. Now, the time has come to act more firmly,” Pence added. Despite Brazil’s adherence to U.S. foreign policy, Brazilian immigrants have suffered the same fate as other Latin American immigrants who try to cross into the U.S., escaping harsh economic conditions and violence at home. According to local media 49 Brazilian children have been taken from their parents after crossing the Mexico-U.S. border illegally, a policy applied by Donald Trump’s administration. 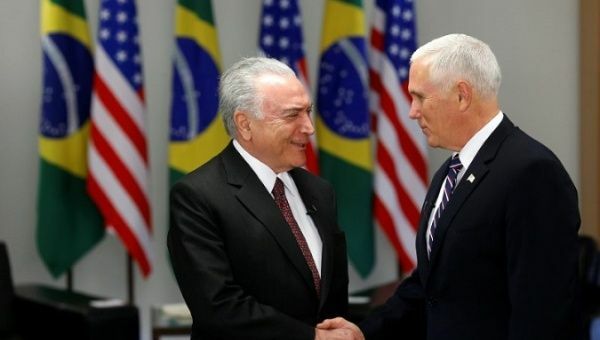 Temer and Pence talked about this issue and discussed ways to send the Brazilian children back to Brazil while their parents remain in U.S. prisons. Pence will visit Ecuador on Wednesday and is expected to travel to Guatemala Thursday for a meeting with presidents of Guatemala, El Salvador, and Honduras.